Running for charity was cool. Starting late was not. 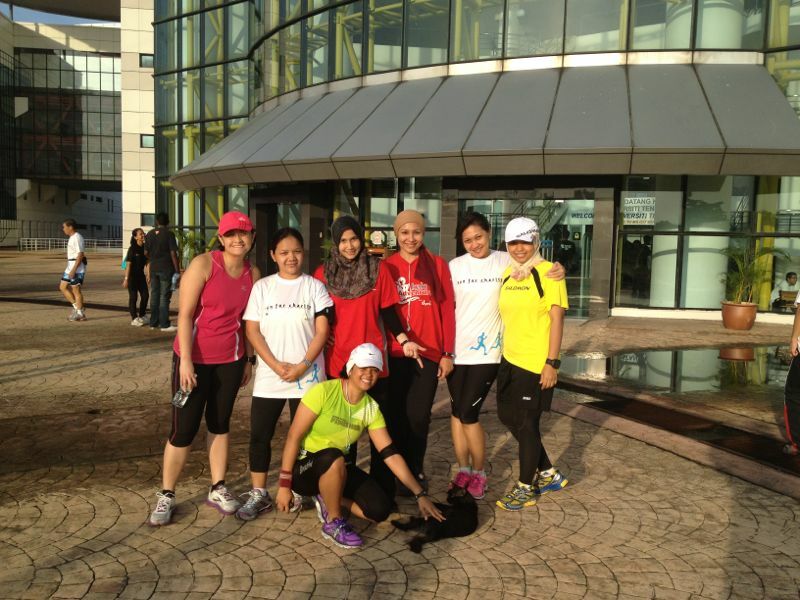 On the morning of 1st December I drove out 40km into Kajang territory to join a group of my lady runner friends to run in a charity event organized by the Faculty of Engineering at Universiti Tenaga Malaysia. I don’t normally drive out this far just to run a mere 5km, but since it was for a good cause (cancer awareness) and Nannoor had promised to have a recovery food and drink get-together afterward, I decided why not. The entry free was RM10, and we got quite a heavy goodie bag filled with buns, water, some pamphlets on the MAKNA cancer NGO and a nicely designed cotton t-shirt which I did not wear but very much appreciated because it featured both male and female running silhouettes on the bottom left corner. Very often event organizers will often only use the male figure in their t-shirt, medal and marketing campaign designs, and completely forget that us lady folk like to be represented, too. We started late – flag-of was scheduled at 7:45.am. on paper but it was 8.20a.m. 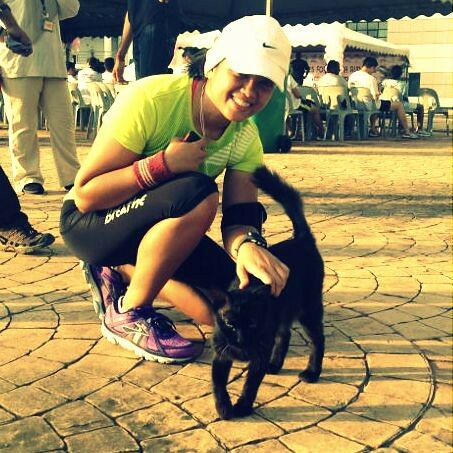 by the time we toed the line, and running in south Selangor always feels hotter to me. The students still have a thing or two to learn about good time management. They prepared water stations but handed out 500ml bottles instead pouring our drinks into cups. I ran with the bottle because I didn’t want to waste the water. It’s a bit annoying. Ribbons – why the heck did they give us so many ribbons? It’s not like they checked them after we finished. “Ala, it’s just a student event!” Nannoor reminded me. Yes, I suppose so. So because they are students, we allow sub-standard race quality. 😛 But I have to hand it to them, they did a good job running it, aside from these issues. The top 150 people who finished the 5km distance first gets a medal and certificate. I’m not sure how many actually ran that morning (I’m guessing 180-200); I did manage to nab no. 68. The medal had a nice gold color to it and was surprisingly solid (I was expecting some cheap plastic version of a medal, like the one I received at SAF Run last year). We were rather rotten – because we didn’t want to wait for the official medal-giving ceremony (that was late, too! ), we forced the students manning the medals to let us have ours earlier so that we can zoom off first. Such gangsters, we were. I could write more, but I won’t – so you can check out my other friends’ recap on this particular event. More pictures, and more hilarious recollections of things I can’t even remember. when is our next recovery run drink? any sponsor? hehehe..